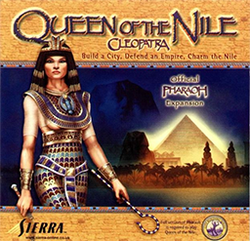 Cleopatra: Queen of the Nile is the expansion pack for the RTS city management game Pharaoh. It was developed by BreakAway Games and published by Sierra Entertainment in 2000. It is one of the games in Sierra's City Building Series. The game installs into an existing installation of Pharaoh and cannot be played separately, as it works by adding more missions and several new elements (a couple new buildings and some changes to the balance of the game dynamics) into the original game. Almost all aspects of Cleopatra are the same as in Pharaoh. The missions, however, are noticeably more difficult. This page was last edited on 27 November 2013, at 18:32.